With the recent big interest and advances with the stereoscopic 3D gaming and the software and drivers making it possible created by DDD, iZ3D, and NVIDIA, it is now possible to play many video games with maximum level of detail and realism in stereo 3D mode. Unfortunately, while we are getting big promises for problem free and breathtaking experience when playing different game titles in S3D mode there are times when the end result is not so good. And with the somewhat closed approach by the S3D driver developers even advanced users and 3D enthusiasts are having trouble helping more novice users that join the stereo 3D wave, but quickly get disappointed by starting off with a bad experience. In an attempt to make things a bit more clear, so that you’ll know if a game works well on any of the three currently available solutions by DDD, iZ3D, and NVIDIA for converting games into stereoscopic 3D games in real time we now have the 3D Game Analyzer available over at MTBS3D. Have in mind that the project is still a work in progress and the first beta is just to show off some of the basic functionality and give you an idea on what is the exact purpose of the project. If you have any suggestions or find any issues you are more than welcome to report them, so that 3D Game Analyzer can become more and more useful to the stereo 3D gaming community. 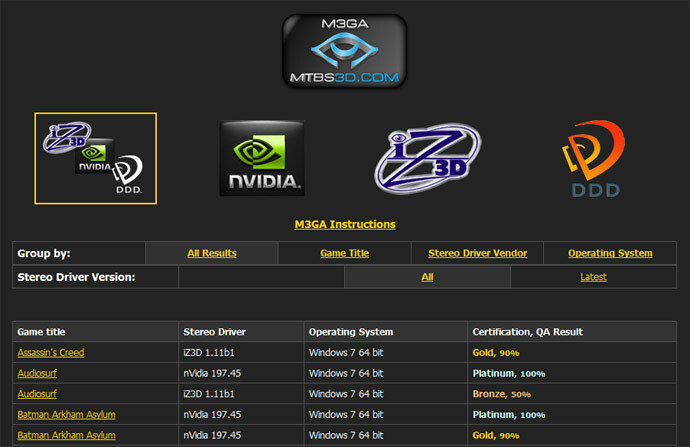 So you probably wonder what is the 3D Game Analyzer (M3GA) exactly? The idea of the project is to create a database that will be maintained with information by its users that report their experiences with the different stereoscopic 3D solutions and game titles they try. The user goes through a series of questions to describe his S3D setup and then to provide feedback for the game he tried and what experience he had with it. Based on that information a rating for each game can be worked out, so that other people will know what works well and what not and thus they’ll be able to stay away from the bad experiences if they wish and go only for games that work and look really good in stereo 3D mode.